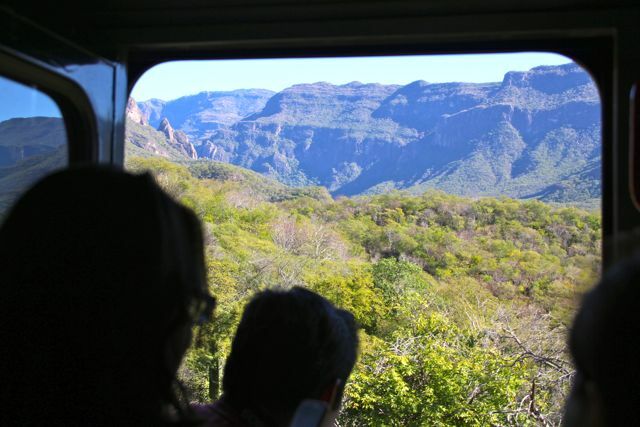 The Chihuahua Pacifico Railroad or as it more commoningly known Chepe, or the Copper Canyon Train is quite remarkable. 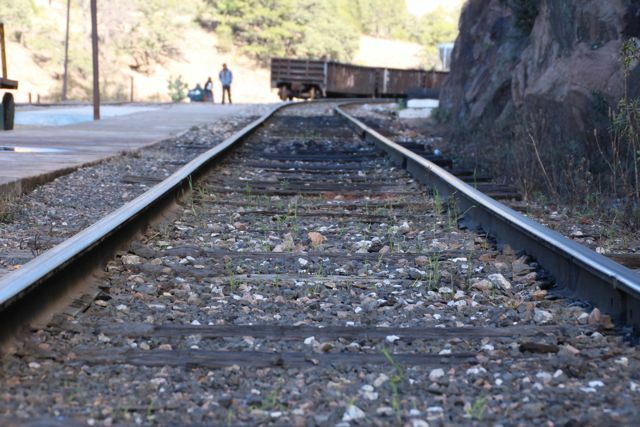 The idea for this train line began in 1861 with a man called Albert Kinsey Owen. After years of canvassing for support he gained funding and construction began after 1879. Work was conducted in various stages before finally concluding in 1961. The rail line covers 390miles through the Sierra Madre climbing 8000ft along the way crossing ravines and passing small villages. Can you spot the tunnel? All up there are 86 tunnels on the route the longest being 5980.97 ft. When the train is hurtling along through the mountains its incredible to believe quite how they managed it – I did have images of Roadrunner and Coyote blasting some TNT in the hills at one point. 39 is the number of bridges crossed, the longest at 1637ft, The highest bridge is 335ft above the ground, Chinipas Bridge, but this one at Temoris I thought particularly interesting. Temoris is 3,365ft above sea level. Formerly a mission founded by the Jesuits in 1677, named Santa Maria Magdalena de Temoris (Temoris was the name of the Indians who inhabited the area). Here the rail line unfolds over 3 levels, almost like scaletrics you might build as a kid! It was here the then President, officially declared the line open here in 1967. But the most interesting thing about train travel to me is who I meet and what I see. I have met the most generous and friendly people so far and they all keep feeding me. The first morning on the train I joined a table with an older couple for breakfast. Hector and Gloria, 44 years married living in Mexico city. Long story short, 2 very entertaining hours later I had seen photos of their extended family including the grandchildren’s dog, sampled Glorias home-baked passion fruit biscuits and was treated to breakfast. Whats not to like about travelling? I only went up to the dining car for a cup of tea! As for the views from the train, they are remarkable and ever changing. 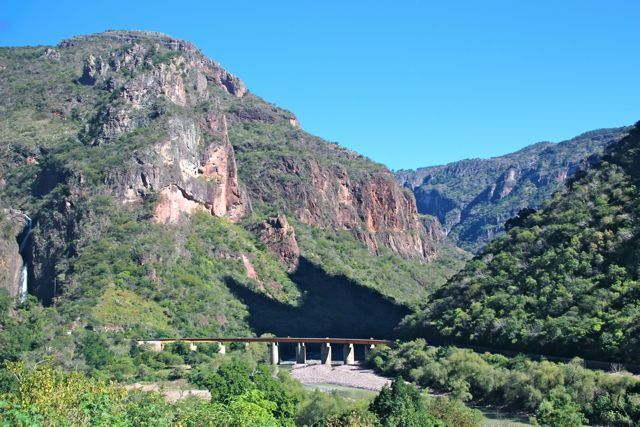 I travelled from Los Mochis to Creel over a number of days stopping along the way and I would recommend to anybody considering it to take their time and visit the towns on the route. 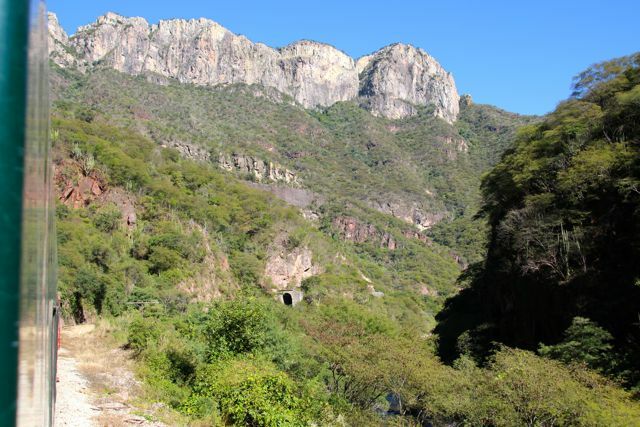 The landscape changes considerably as the train moves into the Sierra Madre and there are several worthwhile stops. It’s also interesting to meet the people in the smaller towns. For me one of the more interesting things to learn about was the Tarahumara people.